Oscar is a scaff plank boat, in 2E survey, certificate of operation for 7 persons. She has a reinforced foam filled aluminium floor, and large reinforced front deck with storage underneath. Stable and strong, Oscar can be used in many roles including bridge inspections, mooring installs, commercial diving work, pump platform, filming platform, or simply ferrying equipment. Length of vessel 6 metres plus rear protection bars. Electric start 4 stroke Suzuki motor, scaffold bar tie rails, front deck winch, and small crane on port side. The roof is removable if required. Ally is a 5 metre flat bottom boat, in 2E survey, certificate of operation for 6 persons. She has, three foam filled seats, low sides and a front aluminium deck with storage underneath. Also a stable vessel, but with lower sides, Ally is very good to work from in flatter water, particularly when working close to the water surface. 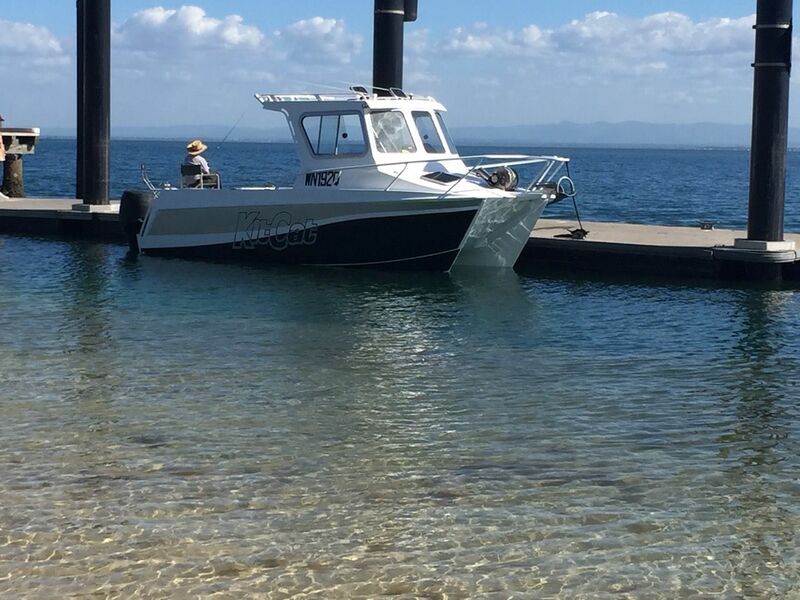 This vessel has an electric start 4 stroke Suzuki motor, with rear engine protection bars. 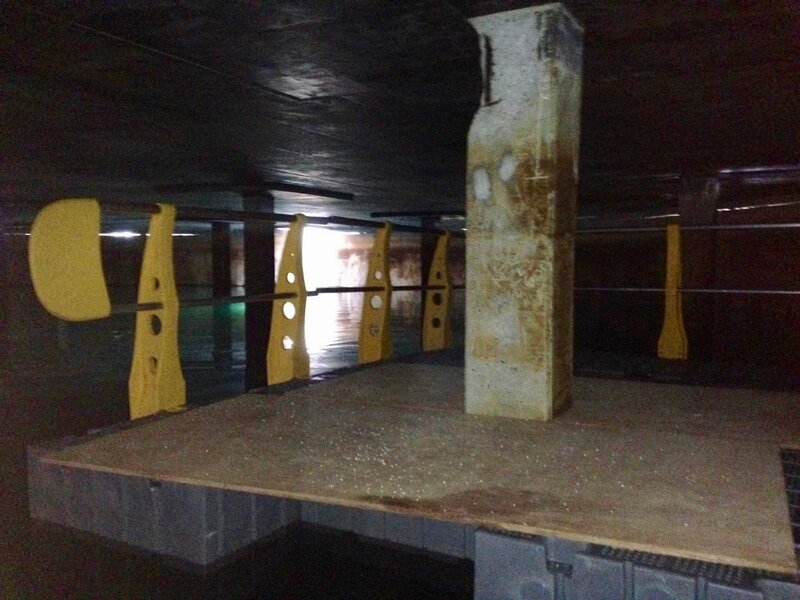 There is no roof fitted on Ally, which make working under lower bridges and wharves easy. KitCat was custom made for our work. She is in 2C and 2D national survey, and carries up to a maximum of 6 persons. 2 x 90 HP four stroke Suzukis allow travelling at up to 30 knots. KitCat is a stable boat at rest or speed. KitCat also has two fuel tanks, and electrical systems, full under deck of foam, and further foam fill in sides. 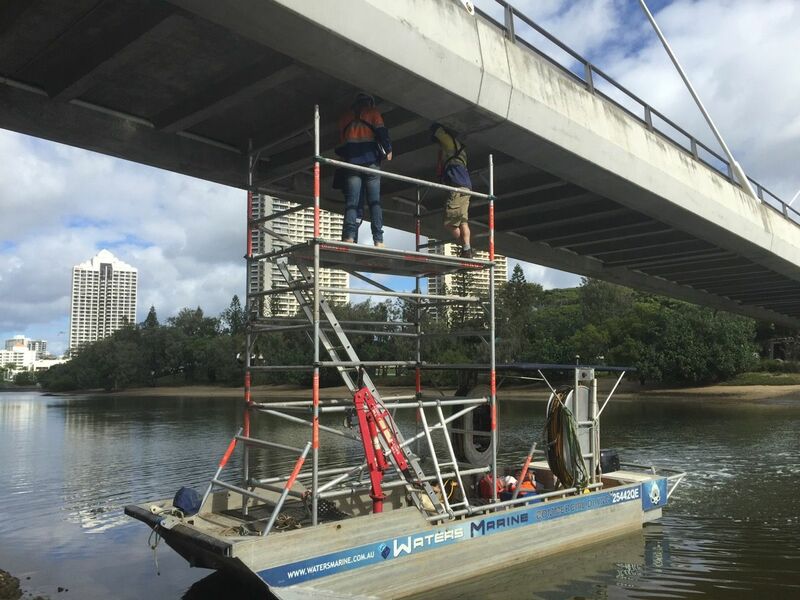 All the survey items required for ocean work are carried on board, and we use currently use KitCat for inspections, pipe pigging work, and moorings from the Gold Coast to Sunshine Coast. Moored on the water, she is ready to go! 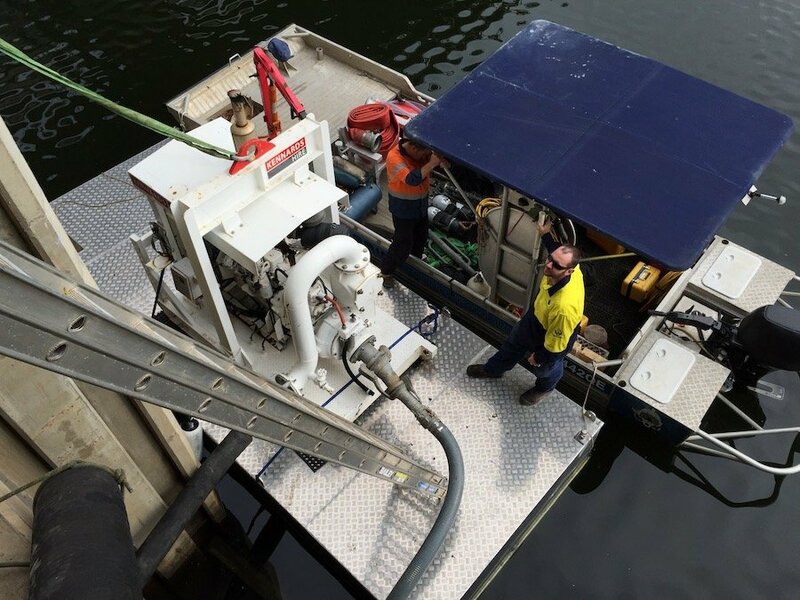 Waters Marine can also provide aluminium barges for work on dams or rivers, to hold pumps as in this photo, or other machinery. Our mooring barge is a steel cat hull, with top deck and moon pool in the centre. It is able to carry four tonne on the deck, and can lift 1 metre x 2 metres through the moon pool. 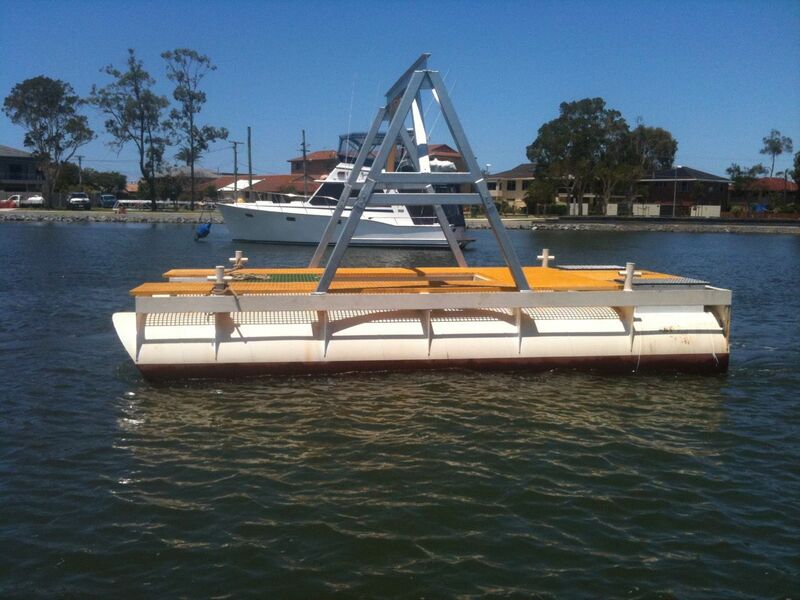 A simple set up for pile work or other repairs, we can set up plastic pontoons to suit, including handrails. 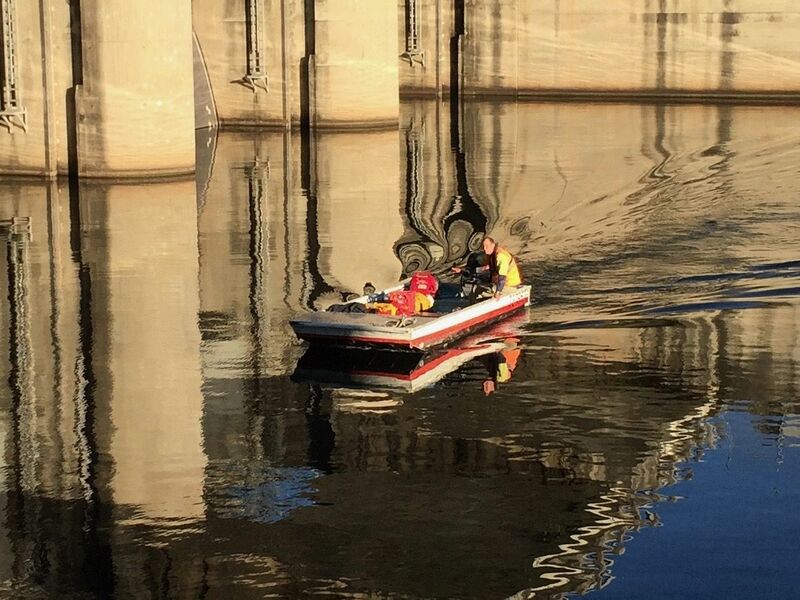 If you are looking for a dive team, who values safety, committed to good quality work, and up for a challenge, then contact us.